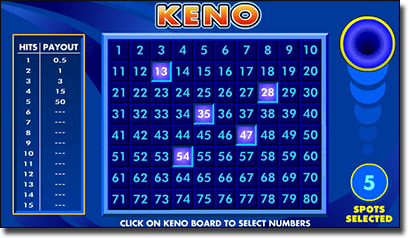 Keno is a fun and popular luck-based game that’s now readily available online. Most major Web casinos will have at least a couple of keno variants. Like every other casino game there is no guaranteed winning formula that will help you win every time – but there are ways to play keno that will better your chances of winning. These are our top tips for succeeding in online keno. Evaluate the odds of each specific game and make an educated decision about which keno variant to play. You’ll find that keno games can vary quite a lot in different Internet casinos. In addition to that, most of the best Web casinos will have more than one type of keno. Keno variants can alter in their rules, how many numbers you’re allowed to select and their payout rates – so always read the rules and payouts prior to betting. Many players will go into a game of keno without knowing the payout rates which is really quite a serious error, so it’s worth your while to play games with a more rewarding payout scheme. In online games of keno, the payout info will always be accessible on the gameplay interface, typically located by clicking ‘Paytable’ or ‘Payouts’, which will display the payout rate on-screen. The great thing about playing keno online is that you can check out different payout rates in multiple variants at multiple online casinos in just a few minutes from the convenience of your own home. It’s worth doing your homework and in the long term you’ll see better returns from doing it. Think about how much to bet on each playing card. There’s no right or wrong amount to bet on a betting card of course – it all depends on how much your betting limit is and how much you’re comfortable losing. Obviously when you bet a higher amount on your numbers, you will be more highly rewarded as well, but you don’t want to blow through your betting amount in one or two games and then not be able to play. Even though there is a lower payout for wins when you bet less on your games, it’s worth drawing it out to be able to play more games. If you’ve allocated yourself a higher amount of money to bet and lose then there’s no harm in betting more money on each of your keno games. You may not hit a win on one playing card but if you purchase multiple playing cards it’s more likely some of them will have winning numbers. Select the most advantageous number of numbers per game. In keno the payout scheme changes depending on how many numbers you select per round. Let’s take a game of keno where you have to pick ten numbers you think will be drawn. If all ten of your numbers are drawn you will win an incredible amount, but the chances of getting ten out of ten are statistically very slim. When you select ten numbers for a game you usually won’t get any payout if only three or less of your numbers are selected (and sometimes even if more numbers are selected you won’t get any payout). This is why a lot of people will select six, seven or eight numbers for a game where you can select up to 10 numbers, because it may not necessarily have the highest payout scheme but it has a more achievable one. If you select six numbers in a game where you can select 10 numbers you will most likely get at least some payout if just one of your numbers is drawn. You can apply this rule to keno variants where you can select more numbers too, just aim for numbers around the three quarter mark of the maximum number of numbers you can select – for example, if you’re allowed to select up to 20 numbers aim for around the 15 mark. Online casinos are much cheaper to run than brick-and-mortar casinos and as a result they are a lot more generous with their payout rates. Overall your payout rates will be a lot better over the Internet, so it’s definitely in your best interests to play keno online, especially if you’re a regular player. If you want to start using these winning tips immediately you can play at these reputable Web casinos, where you can play multiple keno variants for free or for real money at any hour of the day. www.AllSlotsCasino.com – This online abode is one of the oldest on the web, it offers keno on both its free downloadable software and its instant play casino. New players get up to $500 in bonus bets upon sign-up. www.G’dayCasino.com – G’day Casino has an unlimited deposit bonus, which means your initial deposit will be matched 100 per cent by the casino. If you deposit more than $100 they will also send you a free slab of VB. As for the keno it’s a first-rate product with several different variations. www.EmuCasino.com – One of the newer casinos out there, but has already forged a strong reputation on the back of its Australian theme. Types of keno they host include Crazy, Instant and traditional keno and Klub keno. All games are played from their instant-play website. There are also regular bonuses for players and a welcome package if you’re a new customer. The above casinos are approved by eCOGRA and use software like Microgaming and Ezugi for their keno games. This means that they are independently audited and proven to be fair.